SEM will be a leader in secondary education for girls – a school distinguished by the quality of its faculty and innovative academic program, its tradition of leadership and character development, and its supportive, inclusive environment that helps each young woman grow and flourish in her own way. The extraordinary diversity of talent, experiences, and backgrounds in the SEM community will ensure that each of its graduates finds her voice, becomes an active and engaged citizen confident in her abilities, resilient in her outlook, and respectful of the world around her. 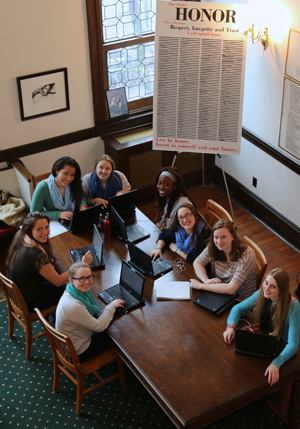 Buffalo Seminary educates college-bound young women from diverse backgrounds in a vigorous and participatory environment that emphasizes development of character, intellectual independence, creativity, service, and leadership for life. Buffalo Seminary strives to make each girl proud of her ability to shape society rather than to be controlled by it and to awaken each student to the opportunities available to women. Nonsectarian since its founding in 1851, Buffalo Seminary provides a setting in which mutual respect is a fundamental principle around which students learn to value people from diverse backgrounds and to accept others on their merits. Having developed this appreciation and awareness, they will be better equipped as adults to help forge connections across diverse communities. Our social and academic honor code reflects the school's moral atmosphere with its expectation of trust, integrity, and respect. Character development is implicit at SEM. At SEM, we encourage our young women to develop strong convictions and to stand alone, if necessary, for what they believe is right. These are the women of the twenty-first century; it is the school's intention to prepare them as they take their place as citizens and leaders in this exciting, challenging time. Recent research provided by the National Coalition of Girls' Schools shows that girls' school graduates are six times more likely to consider majoring in math, science, and technology and three times more likely to consider engineering careers compared to girls who attend coed schools. Girls are inspired to pursue patterns of rigorous thought, fruitful reflection, and clear expression as skills essential to a process of lifelong learning. Our curriculum is designed to ensure that the students will be well informed, well-read, engaged, communicative, technologically able, community-minded, and creative. While SEM has been addressing the deficit of women in all professions since 1851, we now actively address the STEAM (science, technology, engineering, art & design, mathematics) professions through instruction, access to technology, and experimentation. The required core provides SEM graduates with experience in the humanities and in the arts and sciences, and offers them opportunities to develop proficiencies that will enable them to adapt in a world of rapid technological change. Our richly varied program instills a lifelong appreciation for all of the fine arts and an expectation that physical activity will be a continuing part of students' lives.